In Chiyoda Integre Malaysia, our Production Lines are well equipped with hi-tech machines that have the capability to process high complexity products and provide high volumes of output. 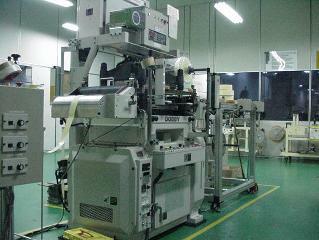 Our technological advanced processing facilities have provided many new options for competitive advantage. Basically, there are six main types of processing methods basing on our current facilities: laminating, die-cutting, graphic screen printing, hot-stamping, slitting and bending processes. Each process is briefly described in the following sections. 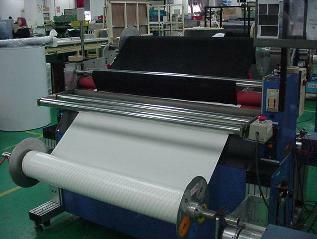 Lamination process in a simple term is an automated process requiring skill and expertise to combine adhesive liner or protector sheet to material, the former should be in roll form and the latter can be either in roll or in sheet form. It has been our obligation to provide the best facilities to our customers who are always on the high demand of upgraded services. On many occasions, raw material purchased are insufficient to justify the needs. 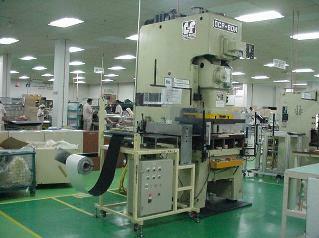 Additional process or combination of one or more materials to make a complete requirement become a necessity. Initially this combination of materials was done manually. Such process is ineffective and are unable to cope up with the overwhelming demand beside contributing high rejection. The introduction of new automated lamination machine has made the laminating process more effective and efficient with guaranteed quality. In the early stage, the use of decorative parts such as logo, foot, emblem etc on electrical products are just to indicate a model, brand or as a basic requirement to the product itself. However, through the journey of times such requirements were upgraded not only as a cosmetic but a requirement of nature. Beauty has become part of quality that creates higher commercial value. To satisfy this new requirement we introduce hot stamping process to these decorative parts for an outstanding appearance. The application of colored foiled such as aluminium, copper, gold etc developed an outstanding appearance to the decorative parts that generates the never ending satisfaction to the end user. Using a series of Hot Stamping Machine with diverse capacity and technology, we have the capability to cater the various needs of our customers demand. Although the application of hot stamping were merely transferring colored foil onto external surface of the product required using certain degrees of heat, but the element of skills and experience plays an important part in producing high quality products. 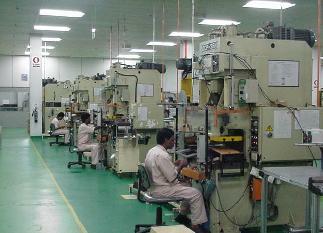 With our reputed expertise and high performance machines we are able to facilitate all these needs. Slitting is a fully automated process used to convert jumbo size material to smaller size material in term of width and length. 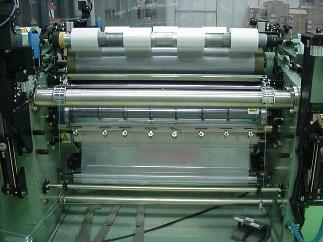 As an added service to our customers we introduce this slitting process to cater all slitting needs, internally and externally. 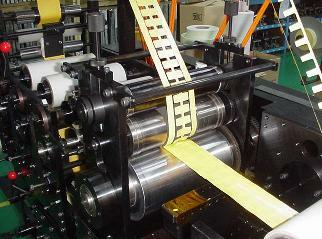 Initially our machines were able to slit roll material such as paper and plastic. But with the introduction of new automated and sophisticated Slitting Machine, we are able to upgrade our service to Slitting Adhesive Tapes and Polyester film as fine as 25 micron. The use of graphic design on Electrical and Electronic products has become significant. Graphic design is being used on most Electrical and Electronic products from a small applicances such as remote control, handphone, calculator up to a bigger house hold products such as Television, Radio, Refrigerator etc. In addition to providing beautiful colors attraction, graphics design also give easy identification to the end users thus simplify the operation manual. A simple definition as a precision process of printing graphics and lettering to material with ink using silk screen techniques describe the meaning of Graphic Screen. Upon printing and drying, the process parts will undergo sheet inspection for quality inspection before die cutting process and final inspection. With the use of latest techniques and high performance printing machine we have confidence in providing quality products to meet with our customers needs and requirements. Die cutting is a process in which fabricated Dies are made to customer's drawing specification and then using Hydraulic, Power Press or Rotary machine to cut the material into the required shaped. Our die-cut division was tailored to have the capability to produce varieties of die-cut shaped parts on different kinds of raw materials such as Paper based, Polyurethane Foam, Polyethylene Foam, Plastic Based, Rubber Based, Adhesive Based, Felt Based and Metallic Based. The ability to produce kiss-cut and through-cut parts on different thickness of materials with specific tolerence has become our main focus and specialty. 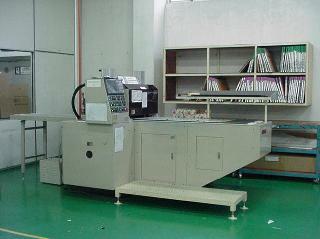 We have various types of machines to be assigned with special jobs to cater all types of requirements. For parts that require high accuracy pitching and need to run into auto assembly such as telecommunication parts, the use of Rotary Cutting Machine will be essential. Rotary Machine have the capability to perform multiple processes such as lamination, auto peeling and die cutting process simultaneously using both cylindrical and flexible cutter. We have varieties of High Speed Press Machine for speed press processes with double roller feeder and two different range of feeding pitch setting suitable to produce parts such as insulator, cushion, spacer, shield, washer, etc. 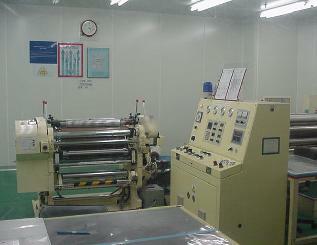 Raw material can be die cut either in sheet or roll form. The Hydraulic and Power Press Machine are utilized to cater the requirement of normal punching process using either wood die cutter or iron tooling. The machines are able to perform lamination, punching and auto peeling process simultaneously with two different range feeding pitch setting capability. 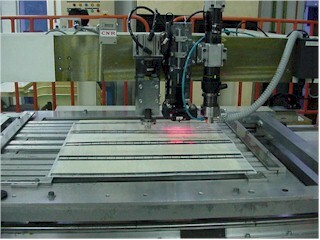 As for the material width range, for wood die minimum is 10mm and maximum is 1200mm and for iron tooling minimum will be 10mm and maximum 600mm. 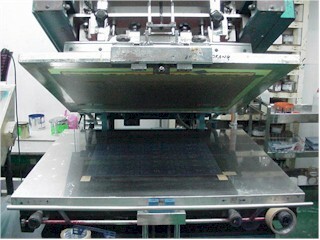 Although bending process represent only a small factor of our total production facility, however its contribution to the total requirement can never be disputed. Certain parts required to go through a few bending processes with significant quality standard. With the combination of new ideas and various bending techniques required for the advancement of the parts, we are able to develop self-fabricated bending machines that enable to satisfy and cater the current needs. 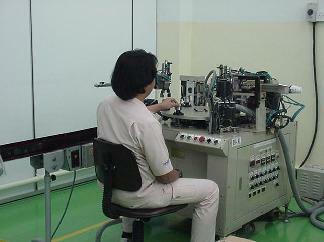 The improvement on the bending methodology will continue in line with the advancement of technology.